Rachel Lee is charming. The first time you meet Rachel, you want to know her story. She has a soft spoken voice and a calm personality. Rachel always listens, truly listens (a rare trait in this wild world). 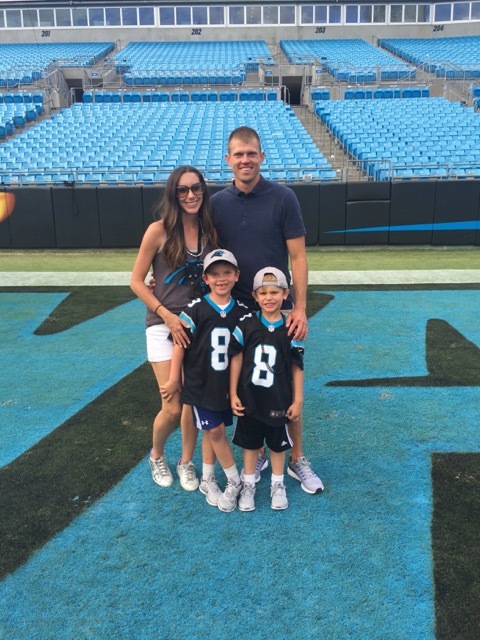 While juggling two small children, starting a charitable fund and managing football season and travel, Rachel stays focused and optimistic. Leaning on her faith and personal goal to honor her daughter (Madelyn), Rachel is making strides across the Charlotte community. Giving back seems to come naturally to Rachel and she is taking loss and love to a new level. I’ve learned so much for this incredible leader. Meet Rachel Lee. Mother, wife, philanthropist and friend. Keep Pounding? You couldn’t stop Rachel if you tried. She is a mom on a mission and we are honored to feature her as this week’s Smarty Mom. We met when Andy was visiting his brother at Clemson (where I also was attending) at Tiger Town Tavern. Go Tigers! How long has Andy played football and how do you handle the stress of watching a game??!!! Andy finished his 13th season this year! When Andy is on the field I just say a silent prayer that he would do his very best and probably hold my breath! Have you always been a football fan? Or, is it something you learned to love? Yes, I grew up a Clemson fan and always loved college football, and now NFL! You have two amazing boys, what is it like to be a busy mother to two young boys during football season? Very busy but also very exciting taking them to games! I’m thankful they are getting old enough to where they can remember cheering on their dad. Your family suffered a truly tragic loss when your daughter (Madelyn) passed away due to an infection in the hospital. She lived eight precious days. How did your family grow in strength during this time? Andy and I truly leaned into our faith. We know we can’t understand why this tragedy happened, but we trusted that Madelyn’s life has purpose. It’s really encouraging to see that coming true now through Madelyn’s Fund. Ryan and Adam were also huge blessings at that time-they gave us the drive and purpose to go about life amidst the grief. How does your family honor Madelyn’s memory in your everyday life? We talk about her often, pray for her nightly, and make sure to welcome questions from the boys. It also makes me smile when I think of all of the hard work put into Madelyn’s Fund by myself, Andy, and a sweet group of friends. I know she would feel so loved. After Madelyn passed, Andy changed is Jersey number. This was a thoughtful and meaningful choice. What is the significance behind this change? Andy changed his number to #8 when he was traded to Cleveland in June of 2015 (just a few months after she passed away) in honor of Madelyn’s 8 days of life. To celebrate and honor Madelyn, you and Andy created a fund to assist families with children in the NICU. How did this inspirational organization begin? When Andy and I started receiving bills from our hospital stay and the funeral home we thought about how awful it would be to experience something so tragic and on top of that have to deal with the financial stress. The idea was planted, and after we joined up with Novant Health Foundation they helped guide us to where we are now. Since late December 2016 we’ve assisted 23 families; 6 of those were assisting a family with a funeral. How can the Charlotte community support Madelyn’s Fund and learn more about your mission? Please visit www.madelynsfund.org to learn more about us or make a donation, or you can find us on Instagram @madelynsfund or Madelyn’s Fund on Facebook. What advice do you have for families who have suffered the loss of a child? This is a really tough one…I think one piece of advice would be to continue to talk about the child and acknowledge their life, no matter how short. I would also recommend reading this post on grief: http://daveyblackburn.com/posts/run-toward-the-roar. I also was really fortunate to be connected with some moms who had experienced something similar (“the club you never want to belong to” we call it), and it was comforting to know that someone had been there before and made it through. Where do you hope to see Madelyn’s Fund in five years? I hope to see us grow to helping families beyond Charlotte and the surrounding areas. Having a chid in the NICU or experiencing the loss of a child is one of the most painful and stressful times in someone’s life. There are so many families who need help and I hope Madelyn’s Fund can meet the needs of many more in the coming years. Best place to go for a date night? Favorite place to shop for yourself in Charlotte? Favorite thing to do as a family in the off-season? Best part of raising a family in Charlotte?